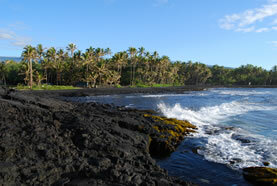 The Kona Coast is on the leeward or west side of the Big Island and shares in its incredible diversity. You can explore ancient lava flows, historical Hawaiian heiaus and baths, hidden beaches, or native villages with catchment water and solar electricity. As you move south, the stark lava flows around Keahole International Airport are soon replaced by lush tropical vegetation as you drive upland from the coast. 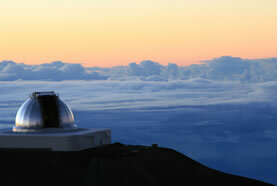 The mountains of Hualalai (8,000 ft.) And Mauna Loa (13,000 ft.) oversee the coast, often from cloud banks. Offshore, whales frequent our waters all year, while tropical fish, turtles, moray eels, manta rays, and dolphins feast over coral beds. Rainfall ranges from 20" to 60" a year and temperatures vary from 80 degrees during the day to a cool 50 degrees at night in the higher elevations, but wait 5 minutes or drive 5 miles and the weather may change at any time. 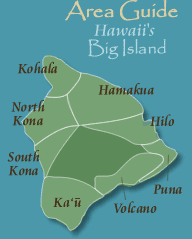 Heading south from the airport, note the Natural Energy Lab (an experimental station which supports aqua-culture products such as spirolina and desalinated water), Koloko-Honokohau National Historical Park (tricky lava road in), and Honokahau Harbor (where most charter boats depart to hunt the deep sea fish). 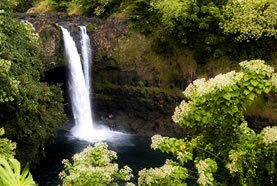 Take time to walk around Kailua-Kona, famous for its cultural sites and shopping areas. King Kamehameha resided here from 1812 until his death in 1819. 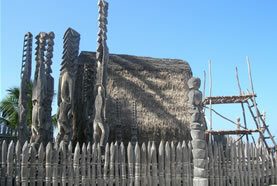 The missionaries' first introduction to the Big Island was here in 1820. The first church, Mokuaikaua, was dedicated in 1837. In 1838 Governor Kuakini built Hulihe'e Palace, which the Daughters of Hawaii have restored as an example of the Hawaiian monarchy. 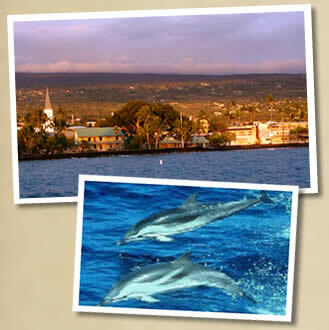 Kailua-Kona is the hub for many Kona Coast activities: a submarine excursion or sunset dinner cruise, para sailing and wind surfing, fishing or whale watching, and so on. 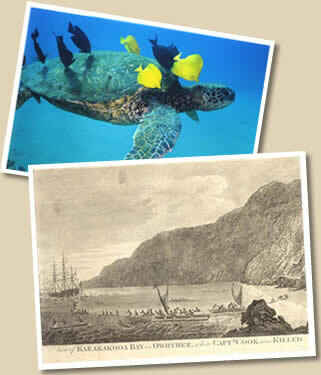 Follow Alii Drive to nearby Keauhou to visit Kahalu'u, one of the best protected snorkeling and scuba beaches, among many that stretch along the rocky but gentle coast. The Kona Coast hosts the International Billfish tournament in August, the International outrigger canoe races in September, and the Ironman Triathlon and Kona Coffee Festival in October each year. Detour upcountry to the quaint artist colony of Holualoa, where locals share their crafts in the many old shops nestled along the roadside. Continue on Old Mamalahoa Highway (Rte. 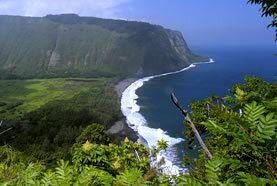 11) to South Kona, as old Hawaii replaces the hotels and bustle of Kailua. Watch for the hidden ocean views, or catch a sunset from the 1200 foot level, as you pass through the small agricultural towns of Honalo, Kainaliu, Kealakekua, Captain Cook, and Honaunau. Their coffee, fruit, and macadamia nut farms are still the favorite abode of local Hawaiians who prefer the old ways. They mingle now with haole (caucasian) locals, who have retreated over the years from a mainland lifestyle that became too commercial and industrial. 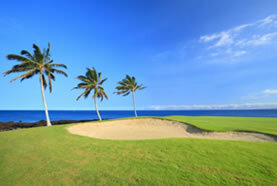 So what can you do in South Kona besides enjoy the sun and sea? Visit the Amy B. Greenwell Ethnobotanical Garden or the Kona Historical Society with its living history coffee farm nearby. Horseback ride or hike to the tip of Kealakekua Bay Marine Preserve, where Captain Cook was worshipped then killed by angry Hawaiians. 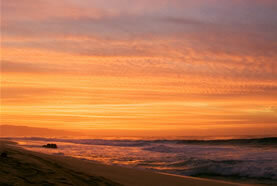 Join locals as they play music on Honaunau Beach most Saturday evenings. Note the historic Aloha and Kona Theaters, once attracting troupes from around the world and now home to cafes fragrant with local products, or join Hawaiian, Tibetan, Chinese, or Japanese cultural celebrations if you are lucky enough to arrive when they occur. Historical kayak and Hawaiian sailing canoe trips are a treat, or just watch the canoe clubs perpetuate the tradition of outrigger racing off the famous Honaunau snorkeling beach. For scuba divers, certified instructors are a phone call away. Don't miss the Pu'uhonua o Honaunau (Place of Refuge) National Historical Park, St. Benedicts Painted Church, or the beautiful black sand beach at Ho'okena State Park, walled by cliffs where many minor ali'i (nobles) were entombed. The Hawaiians believe that the land is the mother of all of us: the rocks are her bones so we should not move them carelessly, the waterflows are her veins so we should not pollute them, the soil is her flesh, which we should respect as stewards. 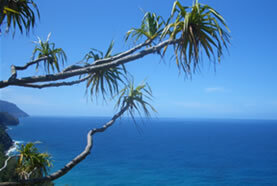 That spirit permeates rural Kona, along with the many unique shops, restaurants, and cultural landmarks. 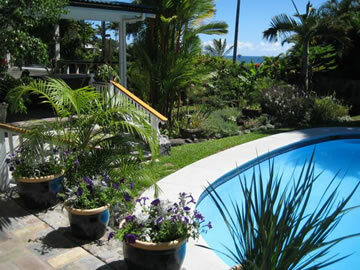 Ask your hosts in the B&B about their favorites as you absorb the heritage of this diverse island.